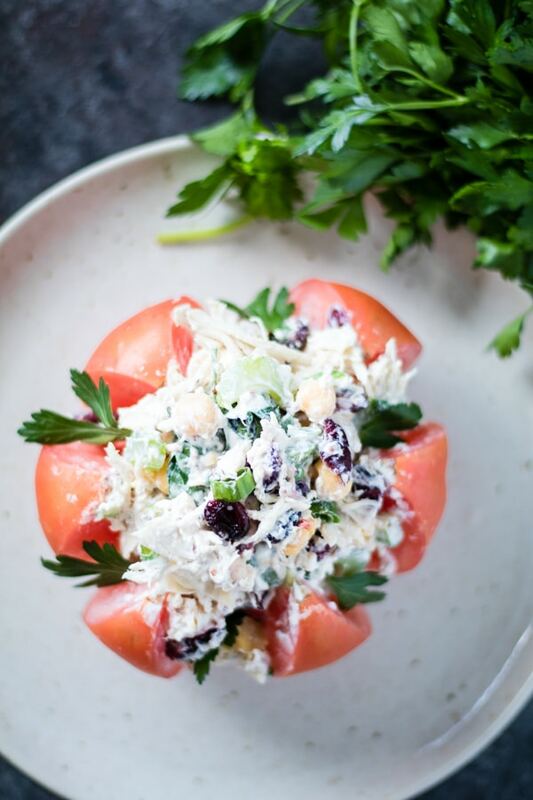 Greek Yogurt Chicken Salad in a tomato wedge is perfect for bridal or baby showers – they can be prepped in advance and hold well in the fridge since the heirloom tomato is firm! Confession: I have not gone to culinary school/training to be able to cook any of the foods on my blog. Foods I post on my blog are not fancy or “hard” to make by any means. My goal is just to make healthful, tasty food with my creative twist on it! I took the mayo out of this chicken salad recipe and used plain, non-fat Greek yogurt instead. And it’s SO good! This mayo-free dish is filling and provides your body with a plethora of nutrients. With the tomato being the star of the show in this recipe it is just screaming healthy. This antioxidant rich tomato contains lycopene which can potentially inhibit cancer cell growth and enhance cardiovascular health. For the chicken salad, I purchased a rotisserie chicken, shredded it, and added in plain non-fat Greek yogurt with celery, green onions, garbanzo beans, and several other ingredients. I really was just making a recipe off the top of my head and crossed my fingers that it turned out yummy. I took the final product to my mom to be my taste-tester and she LOVED it. She said “Wow, this tastes way too good for there not to be any mayo in there!” I guess I did good then 🙂 I hope you all can have some fun making this in your kitchen this weekend too! 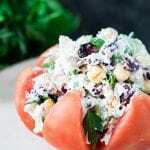 MAYO FREE Greek Yogurt Chicken Salad in a Tomato Wedge. Full of protein, lycopene and fiber to keep you satisfied! Cut your tomato into 8 wedges, being careful not to slice through the bottom. Mix all of the remaining ingredients (except parsley) in a large bowl. Taste and adjust seasonings if desired. 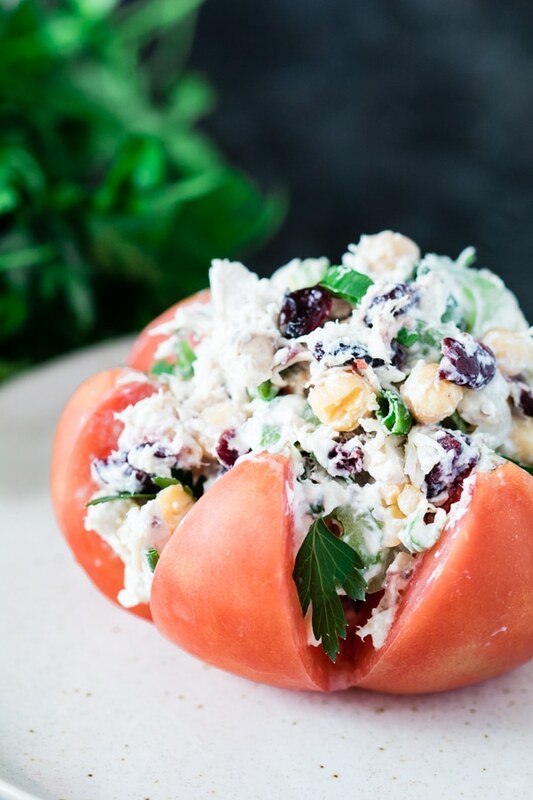 Scoop chicken salad into tomato and garnish with fresh parsley. Can be made ahead of time and stored in fridge until ready to serve! Recipe is inspired by: wholesisters. I loved the idea Nan & Nicole had with the tomato wedge and I created my own chicken salad to stuff the tomato! PIN this Mayo Free Chicken Salad recipe for later!